I got this new set of stamps from Stampendous yesterday and had to use them. LOVE that daisy stamp. Needed a vase for my flowers so die cut the heart... and to see more details and descriptions, just click on card image and enjoy. I'm also using a digi stamp (Happy Birthday banner) from TLC and the digi image is free at the moment but not sure for how long and can be found HERE. This is a cheery card! Love the daisies! And clever use of the heart! Your cards are so amazing. Wishing you peace and happiness in the new year. Wow, what gorgeous flowers. You colored them so beautifully!! Love the big heart too. I love your card!! I can almost smell the daisies! Love the colors and your sentiment in music too! The daisies are wonderful. Thanks for joining us at Rainbow Lady. Beautiful card, Yogi! Gorgeous stamp as well. Thanks for joining us at the ColourQ this week and Happy New Year! Fun and very different take on the ColourQ challenge. Great colours. Happy New Year! That is awesome, thanks for joining us this week at CCCB! Lovely card..Thank you for joining us at Digistamps4joy and good luck. Gorgeous - thanks for using the TLC digi stamp, your card is stunning! I want to wish you the happiest of holiday seasons and thank you for sharing your creativity with us at Aud Sentiments and our Anything Goes challenge. I hope you'll join us for our next challenge too! Beautiful! Love those flowers! Thanks for joining us at CCCB! Wow...gorgeous Card!! Thanks for joining us at Frosted Designs!! I love the way you coloured this image! Thanks for joining us at our Digistamps 4 Joy Something old, Something new - Anything Goes" challenge. This is beautiful! Fabulous colors. Thank you for playing with us at Digistamps 4 Joy. I hope you will join us again for our current challenge! 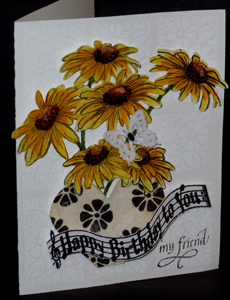 This is such a beautiful bithday card and just perfect for the yellow and white. The yellow flowers are very attractive.